Day 6 of Coco's advent is mouth-wateringly good! And it's so cakey! As a follow up from yesterday's post, after our photography course, Chloe and I met up with Lisa for a cake date at one of our favourite little cake places in Newcastle, The Great British Cupcakery. 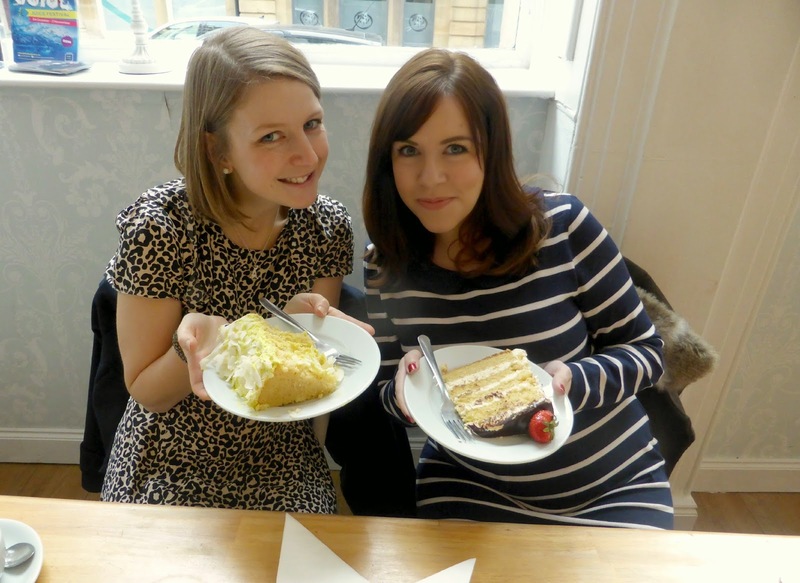 I love cake dates with these two, our love of cake is the yummy, soggy-bottomed layer of our friendship! It's always nice to catch up and have a giggle, and the Cupcakery is the perfect setting to do it! As you may remember, I've featured the GBC on my blog before and I'd definitely recommend it (I've never had an afternoon tea there but hear that they're amazing!). The only thing I would say is that quite often it gets very busy and you can only book a table if you're having an afternoon tea, so for your first visit I'd recommend going at a quieter time to ensure you get a seat. With this visit as well, I was attempting to put some of my new photography skills into practice when snapping at the cakes. *GEEK ALERT* I messed around with the aperture on my camera to try and get different results, and was quite pleased with my first attempt. Pretty soon though, the photography had to end so the eating could begin (and I'm an expert at eating!) so I chose the marshmallow ghost coconut and lime cake (it was the day after Halloween), and tucked in! Chloe and Lisa with their chocolate and vanilla cakes! Me and Lisa (taken by Chloe). My cake looks bigger than me!! The prices are reasonable, the setting is gorgeous and the company was perfect, another lovely afternoon with my lovely blogging ladies. Thanks GBC! This makes me want cake for breakfast!